Cloudteh is a hosting company founded two years ago in 2016 by Aleksandar Stefanovic CEO. Cloudteh is based in Belgrade, Serbia, although their state of the art data centers are located in the USA. They pride themselves in providing customers with high quality, flexible, and exceptionally reliable managed & unmanaged hosting services. 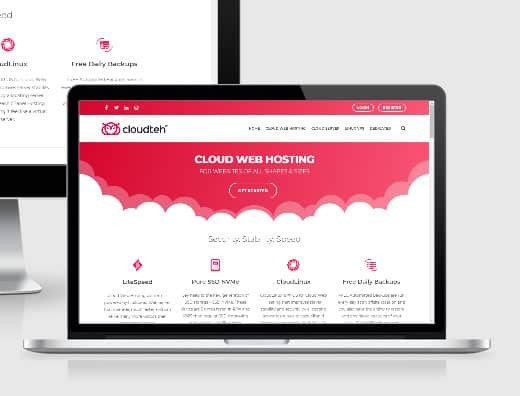 Cloudteh offers shared Cloud Web Hosting, Cloud Servers, Linux VPS and Dedicated Servers on their highly available “bulletproof infrastructure”. Cloudteh utilizes next-gen super-fast LiteSpeed web servers and Pure SSD NVMe to deliver consistency, security and fast load times. NVMe (non-volatile memory express) has been utilized by Cloudteh to accelerate the transfer of data between enterprise and client systems and their solid-state drives (SSDs). Their shared hosting comes with cPanel on CloudLinux to balance server resources and give their customers more control and flexibility. Furthermore, Cloudteh provides a free migration service that allows you to switch over to hosting with Cloudteh and have no downtime. They will transfer your website, emails, databases and all scripts to a new domain with no website downtime free of charge. One really awesome thing about Cloudteh is the fact that they offer free backups as standard. These backups are fully automated and located offsite to give extra resiliency. This reassures their customers that all data is retrievable should there ever be an outage. These daily backups and snapshots are provided as a free “value-add” service by Cloudteh. Cloudteh offers seriously fast load times and efficient content management with their low-density cloud-based servers. When you couple this with the premium hardware that they have invested in, you begin to get a picture of a very advanced, high powered web host. With Cloudteh you can process your dynamic content up to 10x faster. As well as that their Litespeed servers allow you to serve more visitors than you can on Apache and Nginx. Cloudteh has invested in CloudLinux OS – “The super-platform for stability & efficiency in shared hosting”. CloudLinux OS seriously improves server stability, density, and security. This, therefore, creates a server environment that feels more like a virtual server than a shared hosting account. CloudLinux seriously impacts the performance of a host, allowing the host a massive 80% utilization of server resources. Additionally, hosts that use CloudLinix OS see a 70% drop in tickets for performance issues and a 3x drop in reboots. This clearly illustrates that using the latest hardware and software gives hosts that deploy the latest tech the cutting edge competitive advantage. CloudLinux makes your servers stable by shielding your servers from performance spikes. It also prevents slowdowns and downtimes by limiting and partitioning resources per user, thus reducing resource spikes and support costs. Customers with Cloudteh can rest assured that their servers and data is kept safe and secure from DDoS threats. Attacks up to 600 Gbps are easily handled through all network layers protection and pre-configured hardware firewalls. DDos attacks at speeds higher than 600 Gbps are very rare, and there have only been a few registered attacks above 600Gbs. Therefore this states that your data is extremely secure on Cloudteh as they use the best hardware, software and also do daily backups. Cloudteh state that their cloud hosting offers a platform for websites of all shapes and sizes. Their cloud web hosting packages are powered by NVMe SSD storage, powerful LiteSpeed Web Server and CloudLinux OS is the only thing you need to get your website or application up and running. Although Cloudteh is a young company, it has some seriously great kit and outstanding server specifications on offer. You can get world class cloud hosting at affordable prices. They provide some great additional services such as free daily backups (which give customers great peace of mind) and enhanced security. If you are looking for a reliable and stable host in the USA then Cloudteh is well worth a look!